Stop at Heritage Resort -Coorg to discover the wonders of Coorg. The hotel offers a wide range of amenities and perks to ensure you have a great time. All the necessary facilities, including facilities for disabled guests, Wi-Fi in public areas, valet parking, car park, room service, are at hand. Guestrooms are designed to provide an optimal level of comfort with welcoming decor and some offering convenient amenities like television LCD/plasma screen, desk, balcony/terrace, telephone, fan. Take a break from a long day and make use of massage. Convenience and comfort makes Heritage Resort -Coorg the perfect choice for your stay in Coorg. 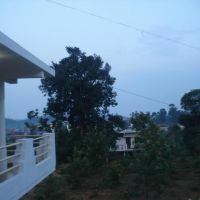 Property Location Located in Madikeri, Coorg Regency is minutes from Madikeri Fort and close to Raja's Seat. This hotel is within the region of Gaddige - Raja's Tomb and Harangi Dam. Rooms Make yourself at home in one of the 30 guestrooms. Cable television is provided for your entertainment. Rec, Spa, Premium Amenities Pamper yourself with onsite massages or make use of the other amenities, which include concierge services and tour/ticket assistance. Dining Enjoy a satisfying meal at a restaurant serving guests of Coorg Regency. Raj Estate Stay is a popular choice amongst travelers in Coorg, whether exploring or just passing through. The hotel offers a wide range of amenities and perks to ensure you have a great time. Express check-in/check-out, restaurant, lockers, room service, luggage storage are just some of the facilities on offer. Shower, balcony/terrace, ironing facilities, complimentary bottled water, fan can be found in each guestroom. Entertain the hotel's recreational facilities, including children's playground, garden, fishing. A welcoming atmosphere and excellent service are what you can expect during your stay at Raj Estate Stay. Ideally located in the prime touristic area of 7 Th Hosakote, Coorg Coffee Flower Resort promises a relaxing and wonderful visit. The hotel offers a high standard of service and amenities to suit the individual needs of all travelers. Service-minded staff will welcome and guide you at the Coorg Coffee Flower Resort. Television LCD/plasma screen, internet access – wireless, desk, fan, internet access – wireless (charges apply) can be found in selected guestrooms. The hotel offers various recreational opportunities. For reliable service and professional staff, Coorg Coffee Flower Resort caters to your needs. Ideally located in the prime touristic area of Pollibetta, Palm Valley Resort promises a relaxing and wonderful visit. Featuring a complete list of amenities, guests will find their stay at the property a comfortable one. Service-minded staff will welcome and guide you at the Palm Valley Resort. Guestrooms are designed to provide an optimal level of comfort with welcoming decor and some offering convenient amenities like air conditioning, desk, telephone, fan, television. Entertain the hotel's recreational facilities, including children's playground. A welcoming atmosphere and excellent service are what you can expect during your stay at Palm Valley Resort. Coorg Jungle Kids Boutique Resort is perfectly located for both business and leisure guests in Coorg. Featuring a complete list of amenities, guests will find their stay at the property a comfortable one. Take advantage of the hotel's luggage storage, car park, family room, car hire, restaurant. Comfortable guestrooms ensure a good night's sleep with some rooms featuring facilities such as linens, mirror, towels, desk, fan. The hotel offers various recreational opportunities. Coorg Jungle Kids Boutique Resort is an excellent choice from which to explore Coorg or to simply relax and rejuvenate. The Kings Cottage Homestay provides you with the luxuries and comfort of a king. Set against the coffee plantations of Coorg, Kings Cottage Homestay allows you a glimpse into nature serene beauty. Kings Cottage hospitality is warm and welcoming and invites you to spend a time in reflection and relaxation with them.The Kings Cottage Homestay is located around 15 km from Napoklu city, which is 45 km away from Madikeri in Coorg. Coorg is not connected by air or railway, but by all-season roads. The nearest airports are Mangalore and Bangalore, which are 125 km and 250 km away respectively. The nearest railway station is Mysore at a distance of 120km. Coorg is well connected by buses from all over Karnataka. The Green Hills Estate was the residence of the Diwans of Rajas of the Coorg in the South-West Karnataka. IT was built in 1898 by Apparanda Rao Bhadur Chengappa. He was the son of the Diwan Bopanna. Designed by Swiss architect this grand mansion sits on the raised clearing in the rainforest, among a hundred acres of coffe and cardamon plantations, paddy feilds and the pepper vines. Its skyline is silhouetted with areca and coconut plams, wild mango, rosewood & a large Burmese mahogany tree. It suites are named after prize winning horses with Chengappa, its current owner, raced on the courses of Banglore and Madras. Driving to the Green Hills Estate takes one across the Cauvery river- which flows five kilometres from the property - past rolling coffe and rubber plantations and forests full of giant bamboo clumps. The neighbouring Nagarhole Wildlife Sanctuary remains the best preserved habitat of the Asian elephant, the tiger, the spotted deer and the bison. The interiors are reminiscent of the planters\' bungalows with lazy furniture and rosewood panelled walls. The stately mansion of Green Hills is full of memorabilia of he ancestor-worshipping family who still inhabits the estate: silver & animal trophies, photographs and books. Porcupine Castle Resort is perfectly located for both business and leisure guests in Coorg. Offering a variety of facilities and services, the hotel provides all you need for a good night's sleep. Take advantage of the hotel's shuttle service, poolside bar, laundry service, pets allowed, car park. The well-appointed guestrooms feature balcony/terrace, fan, television LCD/plasma screen, shower, mini bar. Enjoy the hotel's recreational facilities, including games room, outdoor pool, garden, before retiring to your room for a well-deserved rest. A welcoming atmosphere and excellent service are what you can expect during your stay at Porcupine Castle Resort. Ideally located in the prime touristic area of Pollibetta, Calamondinn Bungalow promises a relaxing and wonderful visit. Offering a variety of facilities and services, the hotel provides all you need for a good night's sleep. To be found at the hotel are daily housekeeping, wheelchair accessible, kitchen, facilities for disabled guests, express check-in/check-out. Guestrooms are fitted with all the amenities you need for a good night's sleep. In some of the rooms, guests can find fireplace, free welcome drink, mirror, towels, non smoking rooms. Recuperate from a full day of sightseeing in the comfort of your room or take advantage of the hotel's recreational facilities, including hiking trails, garden. No matter what your reasons are for visiting Coorg, Calamondinn Bungalow will make you feel instantly at home. Meriyanda Nature Lodge A Forest lodge with 9 wooden stilted cottages nestled in the Rain forest of Coorg, spread within 40 acres of deep woods foraged with a river and waterfall within the resort. 9 elegant cottages offers space for many types of stay, from small meetings to incentives, gifts and reward program, retreat program, VIP, Expat special packages or just as muse for your Travelers. Meriyanda is conceived as a eco resort committed towards preserving and sustaining the diversity of the Coorg s natural and cultural environment. We at Meriyanda accommodate and entertain visitors in a way that is minimally intrusive or destructive to the environment.